A GOOD FIRST DAY, BUT NOW THE WORK BEGINS. Yesterday was the first day of school in Nashville and by all accounts things went remarkably smoothly. Well, minus a few construction issues, which we’ll discuss in a few minutes. MNPS teachers, principals, and district administrators all deserve a tip of the hat. Public education advocates in Tennessee got some good news this past week as State Representative Craig Fitzhugh announced that he would be running for governor. Fitzhugh has been a tireless fighter for public education during his tenure as a state representative, and so his entry into the race is well received. This means a contested Democratic primary this year, since former Mayor of Nashville Karl Dean is also running. I must say that 3 months ago, I didn’t give Dean much of a chance to secure the governorship, but in all honesty he’s been running a solid campaign which has caused me to rethink my position. That said, my support is 100% behind Fitzhugh. Not only is he a true supporter of public education, but he is also the personification of a gentleman. When I cast my vote, character matters and Fitzhugh has it to spare. Last week saw a couple more departures of MNPS district administrators. Director of STEAM Kristopher Elliot is leaving to take a job out in Portland, Oregon. Elliot has been instrumental in developing our strategy for converting middle schools into STEAM schools. He was also an integral part of attempting to plan out district policy in regards to the upcoming solar eclipse despite district leadership’s lack of foresight. I particularly liked Elliot because he was always willing to discuss my doubts on the STEAM philosophy in an open, non-defensive, non-condesending manner. Co-workers often described him as brilliant, and he will be missed. Longtime Manager of Employee Relations Frank Young has also decided to seek opportunities elsewhere. Young was described to me as a talented “ghostwriter.” When an incident took place at a school, he was the one who would write up the incident report. His skill and attention to detail served to protect the district from opening itself up to increased liability. By all accounts, he will also be missed. There was a promotion from last week, when Dr. Shunn Turner was named as the new Executive Director of School Choice. She previously served as Coordinator of Gifted and Talented Education. Turner replaces Dr. Aimee Wyatt, who announced two weeks ago that she would be taking a leadership position with the Southern Region Education Board. 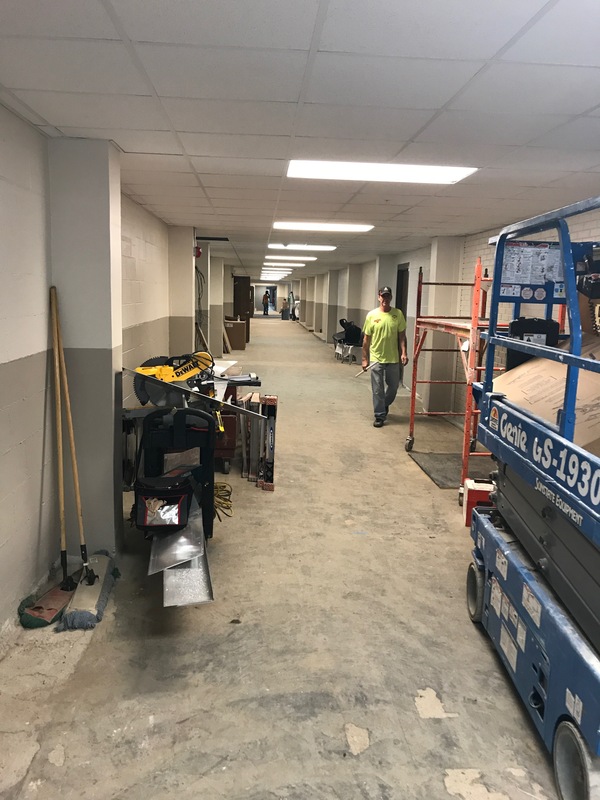 By now you should be aware of the delayed opening of Overton High School due to construction issues. Yesterday I joined the media to take a look at progress. Now I’m not a construction expert, nor do I play one on TV, but to my untrained eye, they need more time. An extra day or two to allow teachers to get a little more set, in my opinion, would pay off as a big benefit further down the road. To be fair, teacher comfort is a welcome expressed priority of Principal Jill Pittman. The big issue is that the state has a mandate on the number of days kids must attend school, and so therefore, all days missed must be made up. Hopefully somebody is trying to coordinate that with the state. On Tuesday it was decided that school would be opening on Wednesday despite ongoing construction. I only hope that this decision is being made in the best interest of students and not the district. Doors open at 6:45 am. Classes start at 7:05 am. Good luck Bobcats! One would think that between the multitude of issues facing the district, including three directors leaving only two weeks before the start of school, the school board would have its hands full with its own issues. Not so if you are self-described multi-tasker Will Pinkston. He decided that the first day of school was the perfect day to publicly attack a local charter chain over the recent departure of their Executive Officer Chris Reynolds. LEAD attempted to respond to Pinkston by going through Board Chair Anna Shepherd. That was unacceptable to Pinkston. Personally I have issues with LEAD’s practices. However, families seem happy with their decision to attend LEAD. 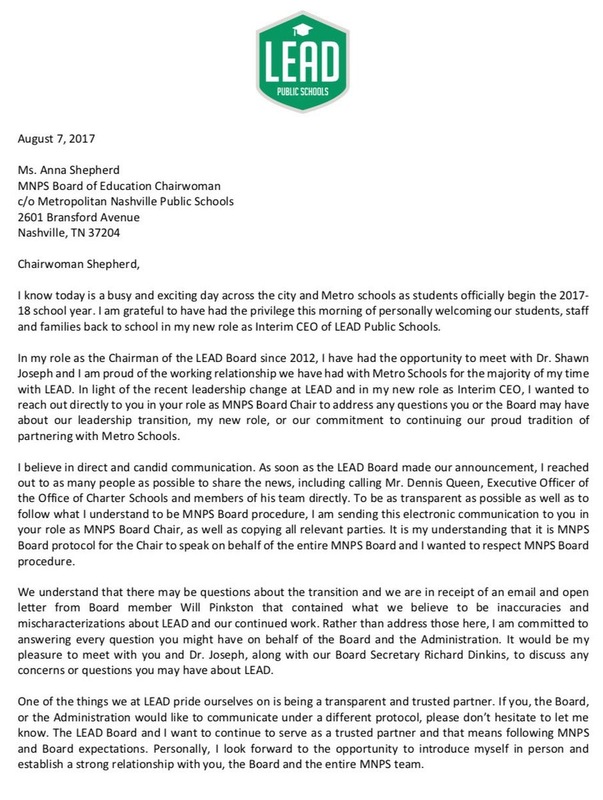 I would say a big part of that decision has to do with what is transpiring with MNPS in general. 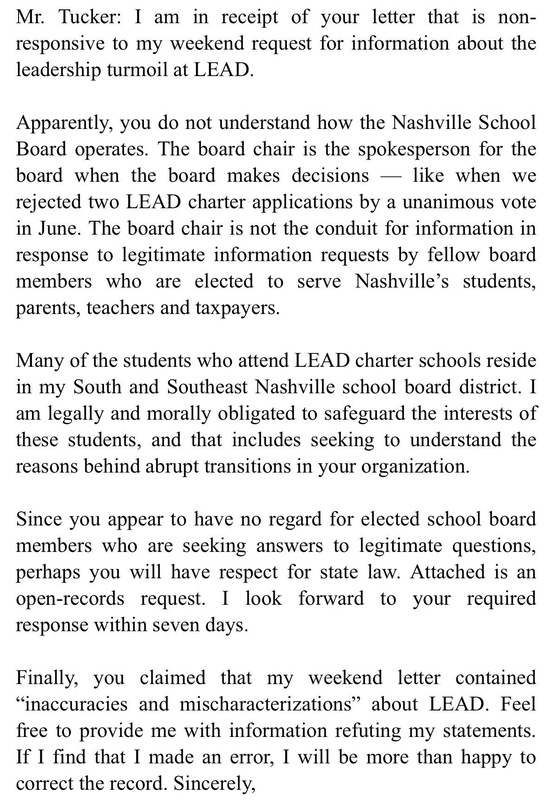 I love how Pinkston claims a “moral and legal obligation to safeguard the interests of these students” yet publicly fails to acknowledge the departure of three Executive Officers from MNPS, whose departures will impact more students than Reynold’s departure. 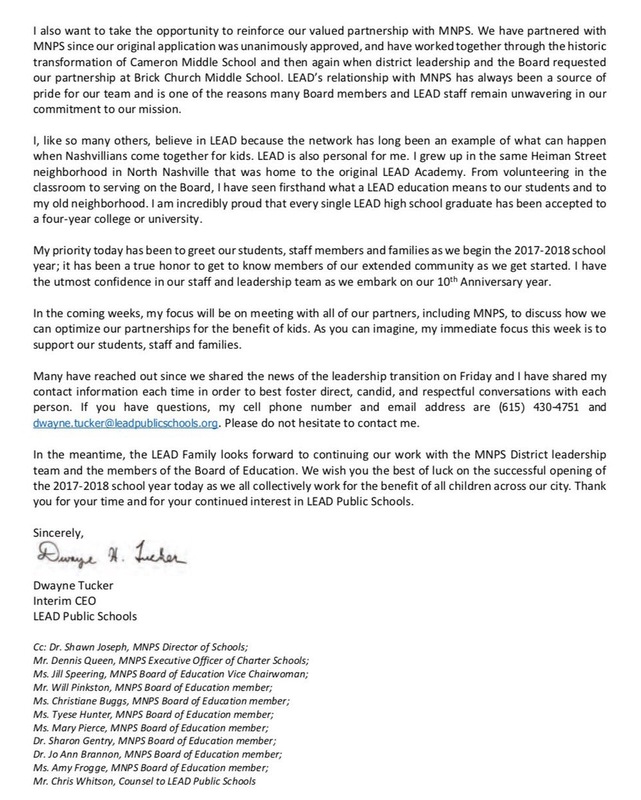 Not only does he not publicly question the departures, but as chairman of the board’s committee on the director’s evaluation, he continues to slow walk the implementation of a meaningful evaluation for the director of schools. Imagine if we were to announce that teachers and students would no longer be evaluated. We don’t feel that there is a fair evaluation process in place so therefore we are going to stop evaluating while we take a year to find an acceptable tool. While I may support that idea, I don’t think the general public would be supportive. One further note on the recent departures. Those people leaving the district are people who have been extremely loyal to this district and to this board. I understand that we have a shiny new director with shiny new ideas, but the way we treat our longtime employees sends a message about how we value loyalty. You don’t get loyalty by not being loyal. Loyalty doesn’t mean blind trust, but it does mean acknowledging people’s contributions and watching their backs. Some things that seem to be in short supply right now. Here’s a couple rumors to whet your appetite on a Monday morning. Duval County Public Schools in Florida is looking for a new superintendent after their last one hightailed it off to Detroit. Rumor has it that this opening has hit the radar of a few MNPS executives. There seems to be an increased number of sightings of those white MNPS company cars in surrounding counties. Perhaps this is a move to remind teachers and families who have left MNPS that they can still come back, or maybe it’s something else. Whatever the case, I’ve received reports of sightings in several neighboring counties over the past couple weeks. Time now to dive into the responses for this week’s poll questions. We got a lot of responses this week, and I’m deeply appreciative of your willingness to play along. The first question asked about your feelings on last week’s professional development training. Teachers districtwide were mandated to attend two days of training, which, for most, was outside of their school building. This was done at a time when most were trying to get their classrooms in order for the upcoming start of classes. This is a sentiment voiced by the majority of respondents. 31% responded that the time could have been better spent getting their classrooms together. The number two answer, at 26%, called the training a waste of time. Only 8% labeled it fantastic. A wise veteran educator said to me a couple weeks ago that effective PD was as much about timing as it was content. Perhaps if the timing had been different the results would have been different. I describe effective communication in terms of an unimpeded flow of water. I deliver a message and you receive the message. Unfortunately, we often add impediments that, much like rocks in a stream, serve to divert and alter the flow. One big impediment is the assumption that my priorities supersede yours. Care needs to be given that both parties’ priorities are given equal weight. Unfortunately the district deemed their agenda more important than teachers’ need to be prepared for the first week of school, and therefore the message was diluted. This resulted in PD that was not as effective as it could have been. Here’s the write in responses. There is some good feedback for the district within these answers. Subs don’t get to attend PD. 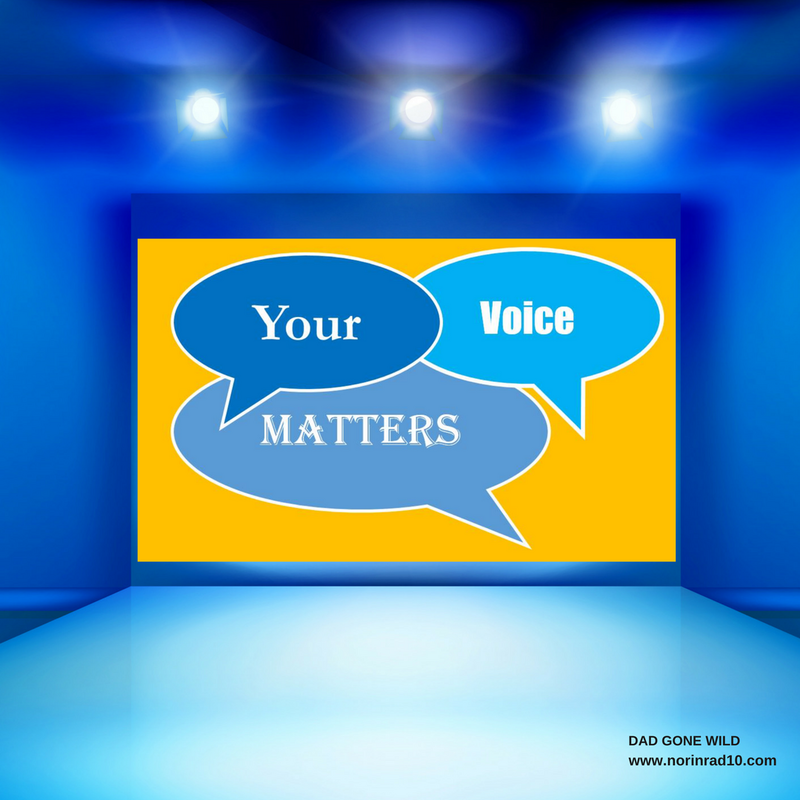 Question two asked for your biggest concern going into the new year. The overwhelming response, at 45%, was district leadership. Coming in second, at 21%, was school leadership. Perhaps that is something the school board might want to look at and dig deeper into. Another veteran educator, who was here during the Garcia years, recently remarked to me about how much these times resemble those days of past, “Everybody knew that we had issues, but nobody would speak up until the state did.” The state spoke up by taking over the district in 2008. You’d think we’d be a little more cognizant of recent history. Here are the question 2 write ins. We can only pick one??? The last question was about the upcoming race to be the next governor of Tennessee. When we did the poll back in May, the clear winner, despite having not declared at the time, was Craig Fitzhugh with 40% of the vote. Karl Dean only garnered 12% of the vote. This past weekend, Dean got 48% of vote and Fitzhugh received 32%. Now to be fair, there were fewer respondents this time, but one can’t help but wonder if Dean’s hard work wasn’t paying dividends. We’ll keep an eye on this. On a side note, it appears that DGW readers are overwhelmingly Democrats. Randy Boyd was the leading Republican with only 6% of the vote. Anarchy, if we pick from this lot. That does it for today. I feel like I gave you a lot of meat to chew on. See you on Friday when I’m sure I’ll have more.